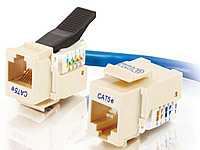 Cat5E RJ45 UTP Toolless Keystone Jack - Terminate without a punchdown tool! Designed for superior performance, this keystone jack will work with wall plates and surface boxes or any standard keystone and angled multimedia wall plate or patch panel. 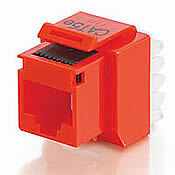 Available in several colors to match housing or allow color-coded port designation in compliance with TIA-606 requirements. 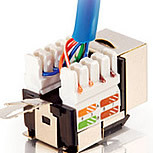 Each keystone jack includes 110ype IDC straight-back termination with strain relief caps, and comes standard with 50 µinch gold plating on the jack contacts. Designed for superior performance, this keystone jack will work with wall plates and surface boxes or any standard keystone and angled multimedia wall plate or patch panel. 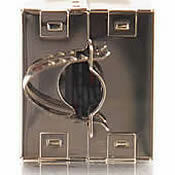 Available in 9 colors to match housing or allow color-coded port designation in compliance with TIA-606 requirements. 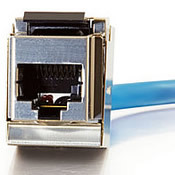 Each keystone jack includes 110ype IDC straight-back termination with strain relief caps, and comes standard with 50 µinch gold plating on the jack contacts. 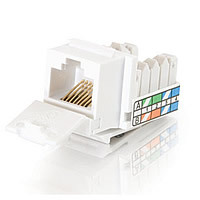 Available in 9 colors to match housing or allow color-coded port designation in compliance with TIA-606 requirements. 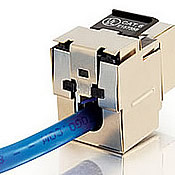 Each keystone jack includes 110ype IDC straight-back termination with strain relief caps, and comes standard with 50 µinch gold plating on the jack contacts. 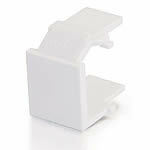 Designed for superior performance, this keystone jack will work with Cables To Go wall plates and surface boxes or any standard keystone and angled multimedia wall plate or patch panel. 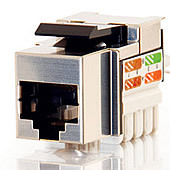 Each shielded keystone jack includes 110ype IDC straight-back termination with a 2-piece metal cover, and comes standard with 50 µinch gold plating on the jack contacts. Designed for superior performance that meets or exceeds industry TIA/EIA 568-A-5 requirements. 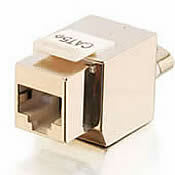 This panelype half shielded RJ45 jack includes 110ype IDC straight-back termination with strain relief caps, and comes standard with 50 µinch gold plating on the jack contacts.